(CBS) - David Freese's jersey is heading to the Hall of Fame. Well, what's left of it. After the third baseman's epic game-winning home run in the 11th inning, Freese's teammates were at home plate waiting for him. Freese's fellow Cardinals were there to "shred" him in what has become a St. Louis post-season tradition. Shortly afterwards, National Baseball Hall of Fame representatives took the remains of the jersey and are bringing it to Cooperstown. David Freese's incredible walk off solo home run capped what many are calling one of the greatest games ever played. This came after Freese's two-strike, two-out triple in the bottom of the 9th that scored two runs and forced extra innings. Naturally, the Baseball Hall of Fame wanted a piece of history from this historic Game 6. 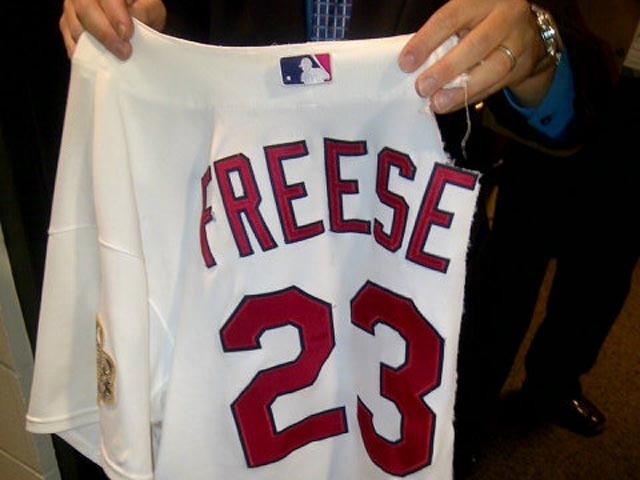 Freese's jersey was an obvious choice. But why exactly was the shirt in pieces? "Shredding" has become a late-season celebration for the St. Louis Cardinals. The "Shredder" is the nickname given to Cardinals second baseman Nick Punto, who picked up the habit this season of going up to fellow players, grabbing them by the top button of their shirt and pulling. The resulting explosion of buttons and cloth leaves the wearer "shredded." Naturally, making the two biggest plays in the Cardinals' season qualifies for a shredding. How exactly the Hall of Fame reps were able to track down the pieces of shirt is something of a mystery, but the St. Louis Post-Dispatch confirmed that the representatives left the stadium with the jersey. Also heading to Cooperstown is Freese's bat, luckily still in one piece.